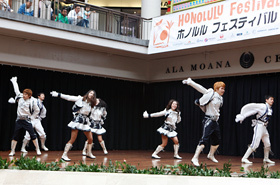 The Stage Performance of the Honolulu Festival offers splendid performances by the respective participating groups from various countries of the Asia-Pacific region every year. It was held on Saturday, March 3 and Sunday, March 4, 2012, at the Hawaii Convention Center, Ala Moana Center and Waikiki Beach Walk. There were traditional Japanese performing arts such as the taiko drum and Nankin Tamasudare (a traditional Japanese street performance). Also, the groups from Alaska and Australia performed their folk art, which was followed by the various dances such as hula and others. 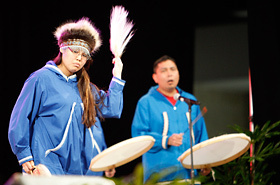 The Alaska Native Heritage Center Dancers performed a traditional Alaskan dance. 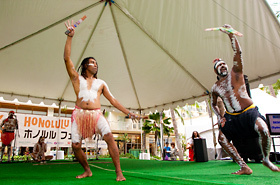 Descendance performed Australian Aboriginal dance and traditional Australian folk song. 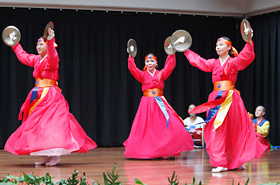 The Korean Traditional Music Association of Hawaii performed a traditional Korean dance. 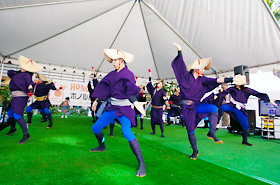 The members of Izena-No-Kai performed a traditional dance from Okinawa. 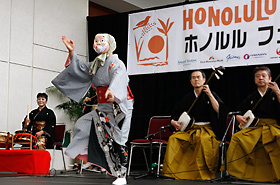 The members of Toyota Tsugaru Shamisen Circle played a traditional Japanese musical instrument called “shamisen” and the dancer was dancing along wearing Hyottoko and Okame mask. They are the members of the Japan Nankin Tamasudare Association. The performance of Nankin Tamasudare is rare to watch even in Japan. 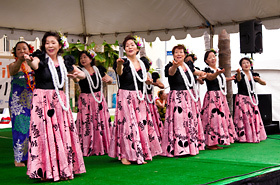 Sugaizanairen has been participating since the first Honolulu Festival back in 1995. They performed the same dance that we saw 17 years ago. They are the members of Shigeko Kubomi Hula Halau. Those smiles of the hula dancers from Japan were all beautiful. 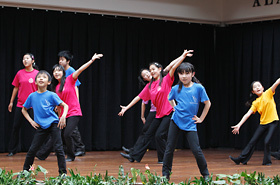 The number of young participants is increasing every year and each of them gives a powerful performance with an up-tempo number. 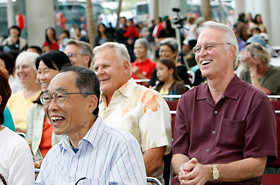 The friendliness of the locals and a relaxed atmosphere of Hawaii set the mood for the event. Getappers, a group that consist of young students has participated for the first time. 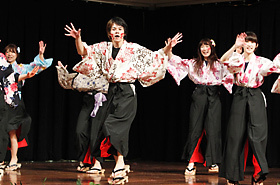 They performed a rare tap dance wearing the Japanese traditional foot wear called “geta”. The students wore a colorful kimono with a pair of geta which looked attractive. They danced lightly across the stage, where the tapping sounds echoed throughout the venue. The audience gave a big round of applause toward them. One of the local girls got excited and said ” Are they Japanese? They are very energetic!” In addition, Getappers talked in both Japanese and English which felt a sense of hope toward the young generation of Japan. The Tokyo University of Foreign Studies Welina! performed a hula and Tahitian dance. All of the members were sophomores, which they started dancing since their freshman year. Despite of short experience, they gave such a stunning performance which the audience were excited and gave loud cheers. The members of Getappers gave such a vigorous and strong performance. The members of Youth Theatre Japan looked enjoying from the bottom of their heart. Japan High School of Music participated as part of learning experience during their school excursion. They are the members of cheerleading team of Inha University. The cheerful voice echoed throughout the venue. 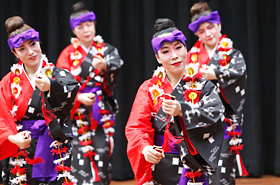 There were Okinawan performing arts such as the Eisa drum dance and Okinawan shamisen since Okinawa has a historical connection with Hawaii. 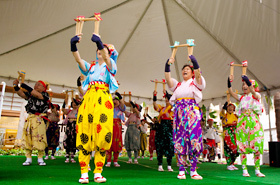 Every so often, many of the audience naturally started dancing to the sound of traditional Okinawan instruments. It makes us happy to see that a lot of elders were also dancing with their beaming smiles. 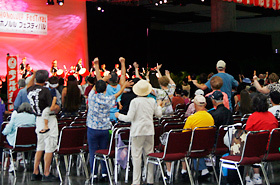 One of the great things about the Honolulu Festival is that the audience can participate in dancing and singing with the performers. 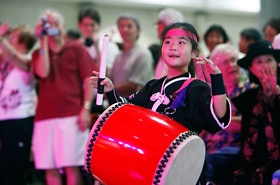 The audience were asked to follow the rhythm of a beating drum during the performance of Taiko Kozo. They clapped their hands and stomped their feet to create the rhythm. Gradually, the patterns of the beat became complex, which were difficult for the audience to follow. This interaction between the performers and the audience created laughter and a sense of joy among them. The audience got excited when the young performer got off the stage to interact with them. The audience stood up involuntarily and started dancing. Some of them even went in front of the stage. 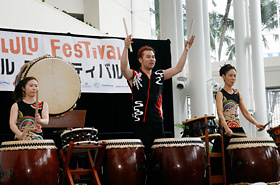 Everybody followed the same rhythm of the taiko drum played by Taiko Kozo, which created a sense of unity. The performers from various countries of the Asia-Pacific region are performing at the Stage Performance. This a great opportunity to let the world know about your culture through various talents and traditional performing arts. Stay tuned for more various performances and traditional performing arts from all over the world!